I find myself building random things for around the house on a fairly regular basis. I decided it was time to setup a dedicated workshop area instead of just throwing up the table saw and tools where ever I could find space. This will help with organization and productivity, both of which could certainly use a lot of help in my case. The first step for me was to clear out the intended area of everything and sweep and clean the floor. There was a lot of sawdust from previous projects so the wet/dry vac got put to some hard use. 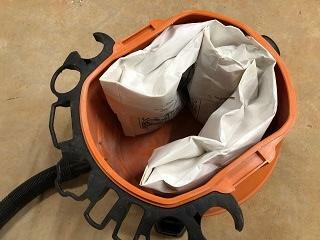 I also tried out dust bags for the first time. 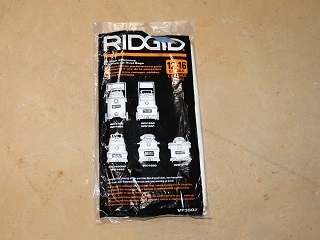 These collect the dust before it hits your filter and save time emptying the wet/dry vac and the filter last much longer. Now that the area is clear I can assess the space. I measure all the walls and transfer the dimensions to a quick doodle. 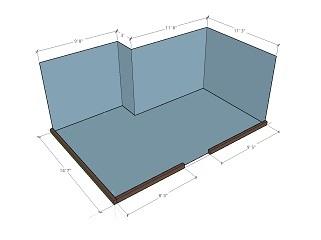 Some quick math shows that I’ll have about 269sq ft. to work with. Definitely more space than the single car garage space I typically work out of. 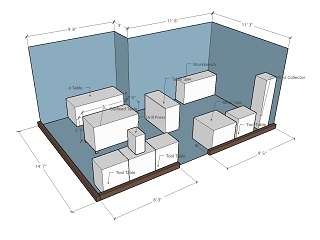 While drawing the space out on paper is more than sufficient, I decided to work up a 3d render of the space. I use rough block shapes to represent items to get a better idea of how benches and tools will occupy the space. This is really helpful because you can quickly move items around the space without having to redraw everything multiple times. By doing this I could pick the layout I thought would work best. Before I dive head first into building work benches fellow community member Eileen had a great suggestion. 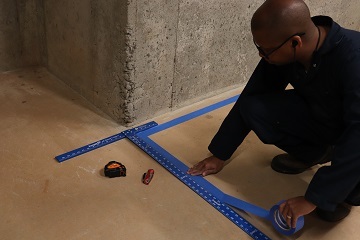 She recommended using painters tape to transfer the dimensions I drew up in the computer to the basement floor. Now I could move through the space and get a better idea of the space available for me to move around the shop. It also gave me a better idea of how placing items in certain places could affect work flow. This revealed some needed changes that I don’t think I would have caught otherwise. This probably saved me a lot of time and money on this project. For now that’s about it. Taking this time to figure out the layout of the room has helped me think through the construction of the room more than I would have otherwise. I’ve defined space for my table saw and outfeed/assembly table, a bench area for the miter saw station and an additional workbench. I’ll go into more detail of what is going where and the thought behind them in a later post. With this work done I can start making plans for an electrician to come out to run some additional power for my tools and dust collection. In the next article I’ll be building the outfeed/assembly table for the table saw. 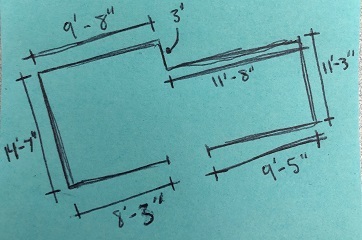 This is the best way to figure out the layout for a shop no matter what size it is. It's way easier to move tape than 5 heavy tools. Just remember that even if the tape layout seams perfect once you get all your tools set up and you start working on projects you may figure out that the spacing is ok but the flow of work is just not smooth. So be ready to move things here and there to get your work flow correct. Keep in mind that not all projects flow are the same but the basics will be the same. ie. You wouldn't want your clamp storage to be on the opposite side of the room as your glue table. Even if that is the only wall available. Some thing wont be clear until you run across them. Thank you Chris for your great ideas. Don't forget to include infeed/outfeed space when laying out things like table saws, jointers, planers. Put as much on wheels as you possibly can. Buy good casters, at least 3" (perferrably 4") in diameter, with locking ones as necessary. Think about dual purpose as you much as you can. For example, use a mobile work bench as an outfeed table for your saw. With the exception of lighting, use 20 amp circuits. Since we frequently use tools in conjunction with dust collection, I used 2-gang boxes for my electrical, with each receptacle on a different circuit. So I could run my 15 amp router along with a dust collector and not worry about anything tripping. Lighting on its own circuit(s). If you trip a breaker with a power tool you're not standing in the dark waiting for a blade to spin down. For stationary equipment that isn't along the wall, use overhead power drops. Eliminates the trip hazard of cords on the floor. The magazine ShopNotes used to have great articles on building jigs, storage, organization, etc. A lot of those projects are also a great way to hone you woodworking skills too. A great post, I am looking forward to seeing the finished project! What a wonderful space! Mapping everything out is such a brilliant idea and gathering all the tips and suggestions from the HD Community is all so great! My question for you is have you thought about sound? Is that part of the basement under the living room? Will you put up sound baffling? How about adding Bluetooth speakers for some inspirational tunes while you work? I am so happy for you to have a dedicated space for productive, creativity! Having a place for everything and everything in its place will save so much time, and boost the flow of productivity. So looking forward to all your projects, enjoy the process of designing and creating your workshop! Remember “Sawdust is a mans glitter” enjoy! Great idea using the tape to layout your design!